– I realized a painful bit of information during the whole Michael Jackson cardiac arrest/heartattack/coma/death saga. People don’t really care where the information comes from, so long as they have it. Since I’m a journalism nerd, I was more interested in who would break the story of his death than if he was actually dead or not. I liked MJ’s music, don’t get me wrong, but I wasn’t a huge fan. Maybe I’m just too young. Anyway, gossip/celebrity news site TMZ was the one that first broke it, leaving established news outlets like the LA Times, NBC and the AP scrambling for anything. As TMZ proudly announced his death, those sites held off on linking back to it, posting of a coma or cardiac arrest. People don’t care that the LA Times should hold more weight than TMZ (which I place in the same category as the dreck that is Perez Hilton). They just wanted news. TMZ doesn’t play the same game as established newspapers, and they don’t have to. If they are wrong, there’s not really any penalty. They’re able to have paid insiders at hospitals, something which would be a big journalistic no-no, so they can be the first to know when some superstar dies or OD’s on cocaine. – Those who know me know that I’ve always been and will always be a sports writer at heart. When I cover a court case, I see a game. When I see an attorney (I always feel like that word should have a “u” after the o) talking with his or her client before the hearing, I can see a quarterback going over the first 15 plays with his coach, knowing it’s the only thing over which they’ll really have control. rather, channel boogie boarding, since I’ve got like 10 channels) and I stumbled upon some kind of pseudo Japanese game show on FOX. The entire time, they’re just laughing at the American contestants, trying to make it through some kind of dumb maze, making it one big spectacle. 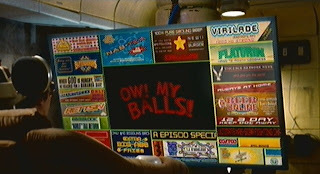 It reminded me of watching the incredible movie “Idiocracy,” where the hot TV show was called “Ow! My Balls!” and it was just a series of clips only America’s Funniest Home Videos-era Bob Saget can enjoy. Over. And over. And over. Is this where we’re headed? Will they ever run out of ideas for a reality show?